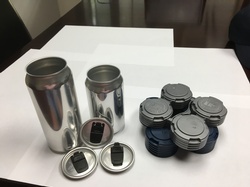 We had the opportunity to show our Model 25D-900 closing the Crowler® 32 oz beverage can from Ball Corp. We improved the functionality of the Lexan© guard that improve access to the Clutch-Brake. 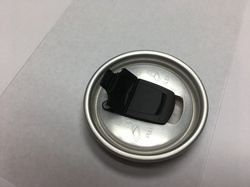 We were also able to show a new 202 diameter resealable lid that can be used on a variety of can sizes. 16 oz cans paired with the PackTek 4-Pak carrying handles can provide a great value to customers and are a proven sales driving force. Also in the works, Dixie is working with two other CBC vendors to create a counter-pressure filler and seamer for Crowler® and Growler sales. 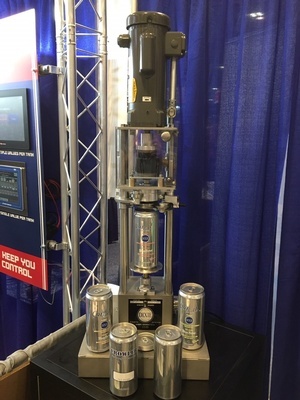 And we are working to develop an automated filler and can seamer line that will fill the need for automated low-volume canning at an extremely affordable price. Stay tuned for more details on all of Dixie Canners innovations.